Ringworm can cause skin lesions in cats, but it can also hide silently. People can get ringworm in cats, so it's important to know about its life cycle and signs. Ringworm is the popular name for dermatophytosis, a frequently-identified fungal skin infection seen in cats. Its name originates from the red, ring-shaped irritation that accompanies infection in human beings. Fungal dermatophyte species identified in feline ringworm infections include Microsporum canis (most commonly identified), Microsporum gypseum, and Trichophyton mentagrophytes. These robust and hardy fungi can live for a very long time in the environment (from months to years) in the form of infective spores (seed-like structures), and they take their nutritional supply from the keratin protein in the hair, nails, and skin layers of their host. Different strains can vary in virulence, which is their disease-causing ability. Ringworm is transmitted by contact with skin lesions, hair, and scales. The fungus can also be isolated from carriers (infected but asymptomatic cats) as well as from the soil and surrounding environment. Carriers do not show signs of infection but can infect surrounding animals. Hairs (which are covered with infectious spores) are continuously shed from the infected cat. The veterinarian should examine the cat’s environment and living style in cases of infection, including close contact with any humans or pets with dermatitis in the household. Kittens and sick and immuno-compromised cats, as well as those from shelters or multi-cat situations, are at the greatest risk for infection. What Does Ringworm in Cats Look Like? Ringworm lesions can appear quite variable in cats; they do not demonstrate the classic human ring-shaped lesion. Cats typically display bald spots with associated scaly, crusty, irritated and sometimes itchy lesions that mimic other clinical veterinary conditions such as mites, allergy, or bacterial infection. Your veterinarian has the diagnostic tools to differentiate these variable conditions from one another. Ringworm is diagnosed by fungal culture of hair and scales or crust from lesions, skin biopsy, KOH-DMSO preparation tests, or Wood’s lamp fluorescence (infected hair or scales will fluoresce under the light). The Mackenzie toothbrush technique test (rubbing a sterile toothbrush over infected areas) is an effective way to obtain samples for culture, particularly in asymptomatic carrier animals. How Is Feline Ringworm Treated? Topical and/or oral antifungal medications are used in ringworm treatment of cats. Some of these medications can have serious side effects and should only be administered under the direction of your veterinarian. Antibiotics are used for secondary skin infections. The flea preventive Program® (lufeneron) may have some utility, but its efficacy is still unclear. Treatment should be continued until hair and skin cultures are negative. Environmental decontamination, though difficult, is essential in effective therapy and can include vacuuming, steam cleaning, and bleaching areas of the home. 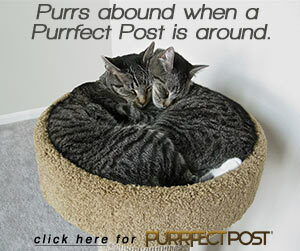 Is There a Ringworm Vaccine for Cats? A ringworm vaccine is available and licensed for use in cats. The vaccine is controversial since it may decrease the appearance of clinical lesions without preventing infection, increasing the number of carrier cats. Can Humans Catch Ringworm from an Infected Cat? Ringworm is a zoonosis, or a shared disease between human beings and animals. Immune suppressed humans (very young or very old individuals, those with chronic diseases such as human immunodeficiency virus or cancer, and people undergoing chemotherapy or post-transplant therapy) are most susceptible to ringworm infection and clinical disease. Please consult your veterinarian if you suspect that your cat has ringworm in order to confirm the diagnosis and start treatment.